I have blogged in the past about the distribution of war surplus to domestic police forces via the Department of Defense’s 1033 program (here and here). Unsurprisingly, Ferguson and St. Louis County have both benefited from the 1033 program. Although precise information is difficult to come by—the Pentagon only releases information on tactical equipment for counties—USA Today has a partial list for St. Louis County, which includes twelve 5.56 mm rifles, six .45 caliber pistols, night vision equipment, vehicles, a trailer, and a generator. Despite its ubiquity across the globe and in United States, tear gas is a chemical agent banned in warfare per the Chemical Weapons Convention of 1993, which set forth agreements signed by nearly every nation in the world — including the United States. The catch, however, is that while it’s illegal in war, it’s legal in domestic riot control. It is also illogical to provide police forces with military grade equipment based on the urgency of the war on drugs or the war on terror. As recent stories reveal (recounted in a fine piece by Radley Balko, WSJ), SWAT teams and the technology they have been provided through 1033 and Homeland Security grants have been used judiciously to break up illegal poker games at VFW halls, to stop underage drinking in a New Haven bar, and to apprehend Tibetan monks whose visas had expired in Iowa. Until that occurs, one fears, the war at home will continue. Locating candidates to support within the two-party system, when one side champions gay marriage and the other gun rights, is hard. [Marc] Whittemore used to run ObamaLA, an organization he said had 2,500 volunteers at one point. But once he started paying closer attention to Ron Paul, he underwent a political conversion and quit the group. If you want to learn more about Pink Pistols, read the Pink Pistols Utility Manual by Patton. “Pink Pistols” was named after an article by that name written by Jonathan Rauch in Salon (for a more recent piece by Rauch, see “The Right Kind of Gun Rights” at Reason and watch an interview at the Atlantic). The article also briefly discusses Tom Palmer (Cato) who has also been an advocate of gun ownership, drawing on his own experience of using a weapon to deter an antigay mob. Palmer was involved in District of Columbia v. Heller (2008), which struck down the D.C. handgun ban and was lead plaintiff in Palmer v. District of Columbia (2014), which ruled that the prohibition on carrying handguns outside the home was unconstitutional. For more on Palmer’s Second Amendment advocacy see David Weigel, “Meet the Libertarians Who Keep Beating D.C.’s Gun Laws in Court” (at Slate) and the embedded video. Two term presidents have a very small window of opportunity to move significant legislation and cement their legacies. The week has not been a good one for the Obama administration. With significant investment in the issue of gun control, background checks went down in defeat. Any explanation of this result would have to include several elements: timing, public opinion, legislative incompetence, and the president’s lack of effective engagement. Anthony Downs’ issue attention cycle is undoubtedly taught in every introductory policy class. Following a salient event (e.g., the Newtown shootings) public attention peaks rather rapidly and then dissipates as new issues displace the old. Bottom line: one needs to strike while the iron is hot. If you fail to move quickly, the public simply moves on. 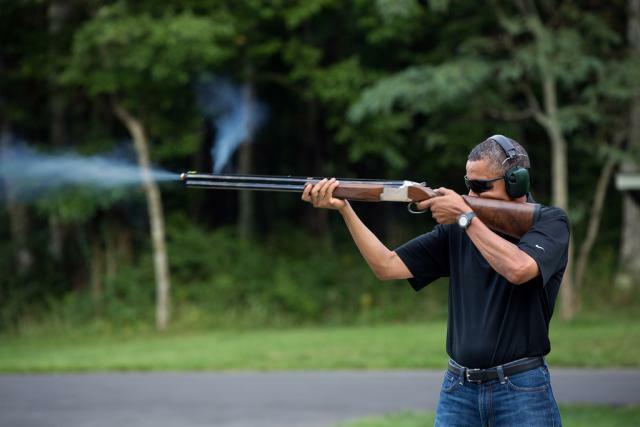 Doesn’t it figure that President Obama shoots left-handed?! I’m really just kidding as I also shoot rifles and shotguns lefty (though pistols right-handed) and few serious people would accuse me of being a man of the left. Moreover, I think the traditional left-right scale is fairly unhelpful (see here). But I do find the release of this photo by the White House to be pure propaganda and thus offensive to the democratic spirit. First, does anyone really expect us to believe that this Harvard-trained, elite, Chicago libgressive is a big shooting enthusiast? Of course, someone with that profile could be. However, it is very unlikely. I can count the number of northern academics and elites who regularly shoot guns on my fingers (hello Marc!). And none of them are Democrats. Of course, there is the big Vermont anomaly – but I don’t think Barry would agree with the Green Mountain State’s gun control regime (which is basically this: aim well and point your gun downrange- for now). More importantly, there is little support for any claim that Obama is a shooter. That is why this Onion piece works as humor. Heck, the guy couldn’t even pretend to be a decent bowler! And this is fine. Just because I like to do something and have the right to do it does not mean that others have to agree with my preferences. Indeed, I’d be perfectly ok with a President who said, “I don’t care for guns and have little interest in using them for any reason. Indeed, I think owning a gun is a poor use of one’s freedom. However, I do think that the Constitution secures the individual right to bear arms, and since I have pledged to support and uphold the Constitution, I will work to protect that right even as I disagree with its exercise.” This is how I think about many rights that individuals enjoy and often (unfortunately) exercise. Yet, I don’t believe the President really cares what the Constitution says nor that he should let it get in the way of his policy preferences. Second, it is probably not chance that Obama is shooting a shotgun in the information operations/propaganda photo since this is how the Dems are trying to triangulate the gun control issue – “We don’t want to stop sportsmen from owning and shooting guns. But true sportsmen don’t need ‘assault weapons. '” I’d be more convinced of Obama’s credibility on the 2nd Amendment if the WH showed him firing my handgun of choice: the Smith and Wesson M&P 9mm. But that would hurt the narrative even though the Administration claims it isn’t going after handguns (despite the fact that Marc pointed out earlier that these are the real weapons of choice for those killing others).